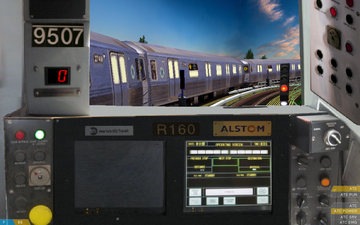 NYCTA class R-160A electric subway train. The train consists of 10 motorized cars. One R-160A unit consists of 5 permanently coupled cars. This train consists of two 2 such units coupled. Photorealistic driver's stand with digital speedometer and pilot lamp. Exterior view available for OpenBVE.